I’ve been loving hot oatmeal for breakfast lately. There’s something so delicious and comforting about it. It’s warm and hearty and makes a delicious autumn meal. I prefer the plain kind (I may have gotten this preference from my husband) and then I top it with fruit and cinnamon. Blueberries are my favorite to add but we’re getting to that time of year when they start to get crazy expensive and they stop tasting good (really a rather bad combo). Now I’m using raisins instead, and those are perfect all year round. A few months ago I started seeing people rave about making “overnight oats.” If you haven’t heard about it, it’s exactly what it sounds like. 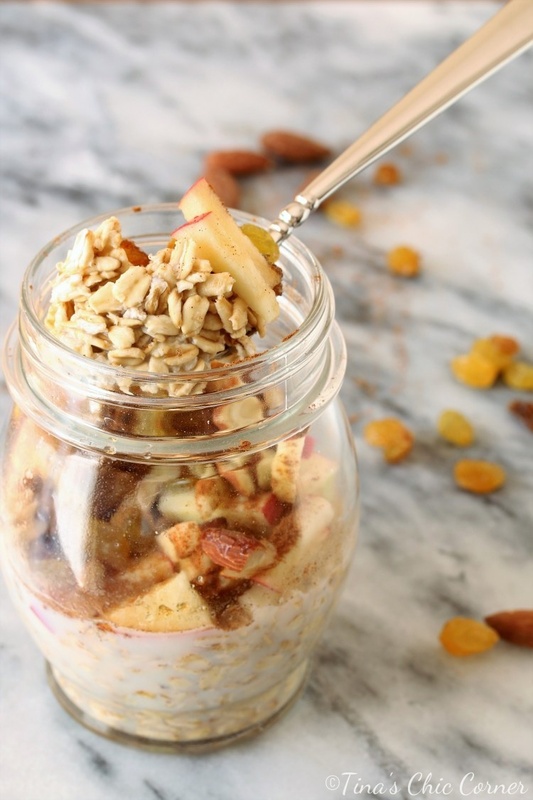 You mix dairy and oats together, pop it in the fridge and let it set overnight. That’s it. The next day it’s just ready to be consumed. Like magic, and without any need to cook it! I was skeptical because it’s a little weird, but it really does work. The oats have a more hearty texture than if you had cooked them, but I’m cool with that. I’ve started decorating my home for Fall time and that got me in the mood to eat something “fall-ish.” Of course I instantly think of apple and pumpkin flavors for this time of the year so I went with an apple pie sort of deal. 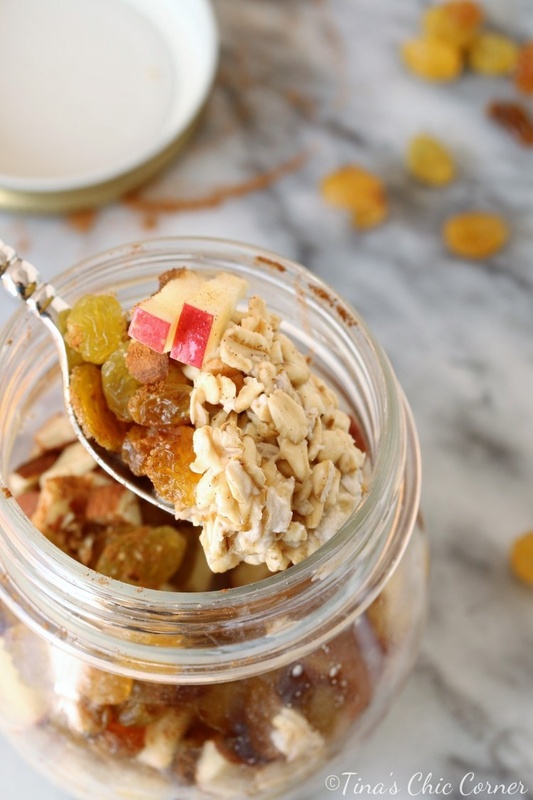 I added chopped apples, raisins, chopped almonds, cinnamon, and a touch of brown sugar. Guys, this combo is heavenly. While this breakfast is super duper easy to make it does require a bit of patience. There is another problem too. I totally forgot to actually make it the night before. Like four times. Womp, womp. In a small container, add the oats and dairy and stir. Cover the container and refrigerate the oats mixture overnight. 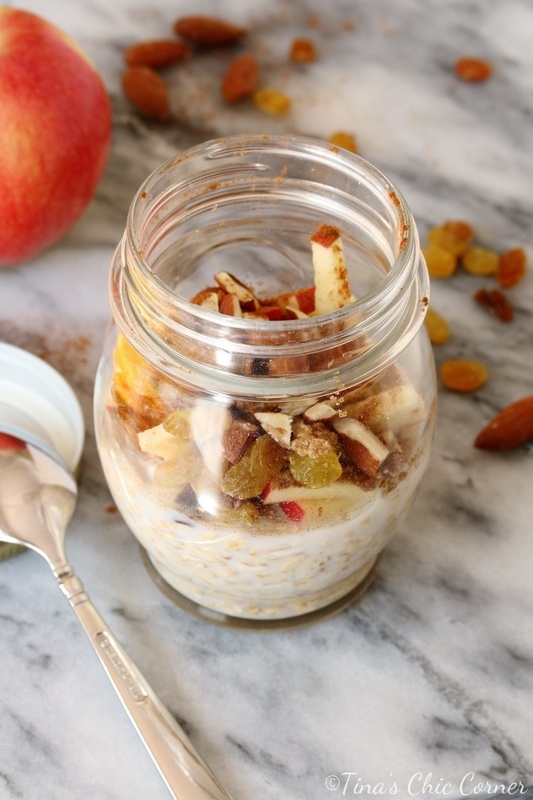 Add whatever toppings that you like in your oatmeal. See first note below. Enjoy! See second note below. * I like to add the toppings to the oatmeal in the morning because I like them on top of the oatmeal, i.e. once the oatmeal has soaked up the milk. My husband added his raisins the night before because he wanted them to soak up some liquid too. If you are using fresh fruit, I recommend cutting it in the morning of because it’ll have a better texture than if you put it in the night before. ** You eat this straight from the fridge, i.e. cold. However, you can also heat it up in the microwave for a few seconds if you like it warm or hot. Also, you can eat it room temperature by just letting it sit on the counter for a while after taking it out of the fridge (which is how I prefer to eat it). Hi Marie! You can use instant or regular. I used the regular oats because that’s what I had in the house. Personally I like the instant ones better because the oats come out softer. I hope that helps! I love oatmeal. This is so easy and so easy. Thanks Tina! I tried this, it is soooo good! I prefer the steel cut oats as they have a crunchy texture. I am with Tina, I have forgotten to put them on the refrig too! It’s so much easier than boiling the oats the traditional way and easy clean up too.